On 7 July 2014, the Israeli army launched a large military operation in the Gaza Strip, codenamed “Protective Edge”, with the stated objective of stopping Palestinian rocket firing at southern Israel and destroying the military infrastructure of Hamas and other armed groups. This development marked the collapse of the Egyptian-brokered ceasefire understanding reached between Israel and Hamas in November 2012, which has been gradually undermined since December 2013. The latest escalation round started on 11 June, when Israeli forces targeted and killed an alleged member of an armed group, along with a child accompanying him, and Palestinian factions responded by shooting rockets at southern Israel. Tensions further increased following the abduction of three Israeli youths in the southern West Bank, on 12 June, which the Israeli government attributed to Hamas. So the UN says that ISrael's current operation is what marked the collapse of the ceasefire, not the incessant rocket firing that occurred beforehand. But look how the UN frames the very beginning - that it started with an Israeli airstrike on June 11, and that rocket fire was a "response" to an Israeli airstrike. What happened before that? An Israeli airstrike killed a Palestinian in Gaza on Wednesday after new rocket fire from the territory prompted Israel's premier to warn he holds President Mahmoud Abbas responsible. Even the Arab Ma'an notes that Israel's airstrike was in response to rocket fire. How do we know which happened first? Because there was quiet for eleven days beforehand. 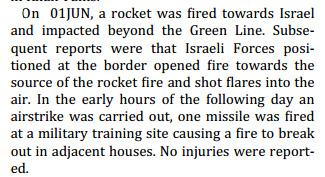 So this NGO documented that Israeli actions only came after terrorists fired rockets first. A Palestinian farmer was hit in the head by an Israeli bullet on Wednesday in the southern Gaza Strip, sustaining minor injuries, medics told Ma'an. The man, who was not immediately identified, was taken to a military hospital in Khan Younis after being shot in the Khazaa area. He was hit as Israeli soldiers retaliated against Palestinian militants who had detonated an explosive device, damaging a military vehicle. May 21: Gazans set a bomb at the border, Israel retaliates. May 23: Disagreement as to who started shooting first. June 1: Rocket fired from Gaza, Israel responds with airstrike the next day. June 11: Rocket fired from Gaza, Israel responds with an airstrike against a terrorist. More rockets are shot at Israel. In three out of the four incidents culminating with the June 11th incident, everyone agrees that Gazans fired first and Israel retaliated. Chances are very good that the same thing happened on May 23. So when the UN mentions the June 11 airstrike as being the first cause for rocket attacks, they are clearly lying. For any incident you can find between mid-May and the current operation, in the Gaza theater, the terrorists always fired first and Israel responded.